HÀ NỘI — The Fourth Industrial Revolution has seen a boom in breakthrough technologies and affected every sector, including agriculture. 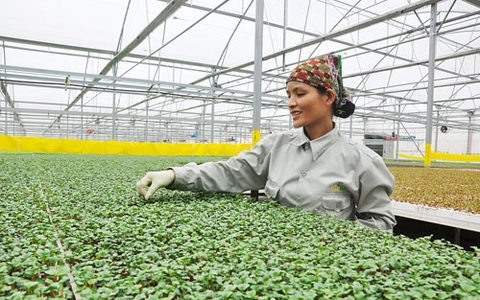 The changes require Việt Nam’s traditionally strong agricultural sector to implement smart agriculture solutions if it does not want to lose its markets. Hoàng Quang Phòng, vice chairman of the Việt Nam Chamber of Commerce and Industry (VCCI) emphasised the importance of applying Internet of Things (IoT) devices in agriculture at a conference on hi-tech agriculture held in Hà Nội on Tuesday. The Fourth Industrial Revolution has witnessed the development of technologies such as artificial intelligence (AI), cloud computing, IoT, bio-tech and nano-tech. He said the active operation of the IoT Open Community of Việt Nam (IOCV) has produced evidences showing how Vietnamese firms might apply smart agriculture. Businesses in the community have built hi-tech agricultural models to control products’ quality, save resources and improve the sector’s competitiveness. IOCV was initiated by VCCI’s Institute of Business Informatics in March. It includes 21 information and technology companies with the goal of building IoT software solutions for agricultural production models. For example, Wala Company under VNPT Technology has applied Delco smart farm demo model to make automatise all processes of monitoring, operating plantations and breeding. The company previously needed 20 to 30 workers to do what requires only five workers after the application of IoT. Bùi Ngọc Sơn, head of the company’s marketing division, said they are applying IoT technology in melon plantations and chicken farms. They use sensors for monitoring to ensure products’ quality. Nguyễn Hồng Quang, chairman of Việt Nam Free and Open Source Software Association (VFOSSA) said they expected to provide solutions suitable with scale of farmer households with affordable investment. Quang added Việt Nam should also study IoT models from the US and Israel to develop more advanced technology products.